West Roxbury, the city’s most politically potent neighborhood, is about to undergo a complete changing of the guard, with three top political spots open for the first time in years. The news that Councilor John M. Tobin Jr. is leaving his West Roxbury district City Council seat of nine years for a post at Northeastern University follows earlier announcements that state Senator Marian Walsh is giving up the office she held for 17 years and state Representative Michael F. Rush is leaving the House to try to succeed her. The special election date has not been set. But the race is underway. Reported to be running are James W. Hennigan III, who boasts a strong family political pedigree, and Matt O’Malley, who twice ran unsuccessfully for a citywide council spot. O’Malley launched his campaign this past week, and on Friday picked up the support of Tobin and his chief of staff, David Isberg, who had spent part of the week considering a campaign of his own. “I always had the dream to run for it, thinking it would be later on down the road,’’ said O’Malley, 30. Suddenly, he is halting his work as field director for Steve Grossman’s campaign for state treasurer to launch a campaign of his own. The City Council district includes West Roxbury and Jamaica Plain, as well as parts of Mission Hill and Roslindale. 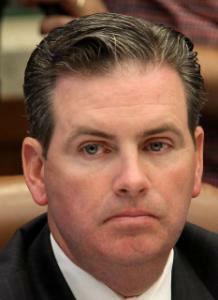 Hennigan is the brother of Maura Hennigan, Suffolk County criminal clerk, who previously served as a city councilor, first representing Jamaica Plain and West Roxbury as the district councilor and later serving at-large, for almost 24 years before she ran unsuccessfully for mayor in 2005. Their father, James W. Hennigan Jr., was a state representative and state senator who ran unsuccessfully for mayor in 1959 and was a long-term member of the School Committee. Their grandfather has a school named for him in Jamaica Plain. James Hennigan, too, is an active community leader and volunteer; he could not be reached immediately for comment. Two other Jamaica Plain women confirmed that they are considering launching campaigns. Lawyer Valerie Frias, 37, who recently left a job as senior policy analyst for the Massachusetts Taxpayers Foundation, said she is giving close thought to a campaign and is discussing it with family and friends. So, too, is Jessica Taubner, policy director to Councilor at Large Ayanna Pressley. Taubner, 32, previously worked for the Legislature and has a master’s in public health policy. She said she expects to make a decision after talking with supporters. The field may be fluid because candidates can run for the Legislature at the same time, and in West Roxbury, that field, too, is wide open. Walsh, a Democrat who previously served in the House, announced she would step down months ago, after fielding criticism for accepting an appointment to a $175,000 patronage job that had been vacant for a dozen years. She later declined the job offer from Governor Deval Patrick. She was among the first of dozens of lawmakers to announce she would not run for reelection after a bruising year for incumbents. Rush, who wants to claim her seat in the Senate, faces competition from Westwood Democrat Michael F. Walsh. Brad Williams, a Republican who chairs West Roxbury’s Republican Ward Committee, is also in the running. The House seat Rush is leaving has no Republican contenders but has attracted six Democrats: Matthew J. Benedetti, Edward F. Coppinger, Robert W. Joyce, Pam Julian, Paul P. Sullivan, and Kelly Ann Tynan. Gerry Cuddyer, chairwoman of the city’s Board of Election Commissioners, said she will recommend that the city not schedule the special elections on the same days as the statewide elections. The state plans a Sept. 14 primary and a Nov. 2 general election. The city elections are nonpartisan and the top two vote-getters advance to the final election. Stephanie Ebbert can be reached at ebbert@globe.com.